The manuscripts submitted for publication must be previously unpublished research works written in Korean or English, which are not being considered for publication elsewhere. All the authors must have agreed to the submission and to the order of their names on the title page. They must also have agreed that the corresponding author may act on their behalf throughout the editorial review and publication process. The corresponding author is responsible for obtaining such agreement. The editors generally seek the advice of experts about manuscripts; however, manuscripts considered by the editors to be inappropriate for Food Engineering Progress may be declined without review. The names of the reviewers are hidden from the author. All papers will be critically read by at least two anonymous reviewers, selected for their competence in the subject area of the paper. Acceptance of the paper will depend upon its scientific merit and suitability for the journal. A paper may be accepted in its original form or subject to revision. Reviewers are asked to evaluate manuscripts on the scientific value of the work, the level of interest to the broad and diverse readership, the appropriateness of the literature citations, and the clarity and conciseness of the writing. The reviewers' (and editor's) suggestions will be conveyed to the author, who will then have an opportunity to revise the paper. Manuscripts written by authors who are unsure of proper English usage should be checked by someone proficient in the English language before submission. Manuscripts failing to meet the standards or poorly written or formatted are editorially rejected without further review. Manuscripts accepted for publication in Food Engineering Progress are published online rapidly, whereupon they may be cited by reference to the unique Digital Object Identifier (DOI) that is assigned to each manuscript. The publication date is recorded as the date a paper first appears online as a Food Engineering Progress Publications product. All papers are structured in yearly volumes and quarterly issues. Nevertheless, articles are published online immediately after acceptance and production. The corresponding author of an accepted manuscript will receive e-mail notification and complete instructions when page proofs are available for review. The PDF proof made available for review is of publication quality so that authors may see a true representation of both the text and the graphics prior to publication. Page proofs should be checked carefully against the manuscript (in particular, all tables, figures, structures, captions, equations, and formulas, as well as clarity of the graphics), as this is not done by the Journal Publications office, and the corrections should be returned as soon as possible. No paper is released for publication until the author’s changes have been made or the author’s approval has been received. Authors should not request that their page proofs be held for an extended period of time. Manuscripts for which page proofs are not returned in a timely manner will be withdrawn from publication. Routine rephrasing of sentences or additions are not permitted at the page proof stage. Alterations should be restricted to serious changes in interpretation or corrections of data. Extensive or important changes on page proofs, including changes to the title or list of authors, are subject to Editorial review. It is the responsibility of the corresponding author to ensure that all authors listed on the manuscript agree with the changes made on the proofs. Comments on the proofs should be returned within 72 hours of receipt to ensure timely publication of the manuscript. A page charge is effective for all manuscripts on original research. An invited review article is exempt from page charges, provided it is approved in advance by the Editor-in-Chief. The actual charge per printed page will be notified to the author along with the manuscript for galley proofs. The publication fee is KRW 70,000 per printed page plus KRW 40,000 as review fee. Free reprint copies of the published article will not be provided to the corresponding author. Authors may purchase reprints by requesting when manuscript is accepted. An order form with prices will be sent with proofs to the corresponding author. Korean Society for Food Engineering (KSFE) reserves the copyright of all papers published in Food Eng. Prog. All inquiry on the submission of papers and publication process shall be made to the Executive Office of Korean Society for Food Engineering, Rm 4101, 809 Gwan, Chung-Ang University, 4726 Seodong-daero, Daedeok-myeon, Anseong-si, Gyeonggi-do 17546, Korea (Tel: +82-31-670-4662, Fax: +82-31-676-9285, Email: food@foodeng.or.kr). Every article published by us constitutes the Version of Record (VoR): the final, definitive, and citable version in the scholarly record. The VoR includes the paper, revised and accepted following peer review, in its final form, including the abstract, text, references, bibliography, and all accompanying tables, illustration, data; and supplemental material. Basically, it is our policy not to amend or alter this published VoR. However, if there is a significant error introduced by us during the production of the journal article, we publish corrections to the VoR as errata. A ‘significant error’ means an error which affects the scholarly record, the scientific integrity of the article, the reputation of the authors, or of the journal. We do not publish corrections that would not affect the article in a material way, nor significantly impair the reader’s understanding of the article. If you have found an error in your article, please review the guidance below. And you believe a correction is necessary in your article, email us at food@foodeng.or.kr. If we agree a correction is needed, and your article has been published online only, we will correct the error online, linking to a notice of correction via a footnote. However, if we find a correction is needed, but your article has already appeared in an issue, online and in print, we cannot make any changes to the online version. Instead, we will publish a correction notice which will be linked to the original article online. All authors of the submitted manuscript should be members of the KSFE for submission and consideration of manuscripts. Authors should submit their manuscript electronically by using online manuscript submission system available at http://www.foodengprog.kr. The “date of receipt” that appears in the published paper will be the date when Editorial Office received the manuscript. The format should be as a Microsoft Word document for the PC not MAC. Manuscripts must be typewritten, double-spaced with 2.5 cm margins on all corners in A4-sized papers (210×297 mm). Font type of Times New Roman with 12 pt is required. Manuscript should have page numbers with line numbering except title page and pages containing tables, figure legends, and figures. Each figure should be labeled with a figure number. Authors willing to access these material would have to contact the editorial office of the journal. Research articles are reports of original, scientifically sound research. Articles should be structured under the section headings Introduction, Materials and Methods, Results, Discussion, Acknowledgments, and References. The standard length of a published article should be six printed page long including tables and figures, which is approximately the equivalent of a Word document of 12 A4 pages of double-spaced 12 pt Times New Roman font. The name, affiliation, city with zip code, country, telephone and fax numbers with country code, e-mail address of the corresponding author. Place an asterisk after the name of the corresponding author. The name and affiliation address for each author except the corresponding author should be indicated by superscript Arabic numbers (1, 2, 3, etc). Abstract must be both informative and concise. The abstract should not contain any undefined abbreviations or unspecified references. All non-standard abbreviations must be defined. The overall length should not exceed 200 words. This must be provided with 3 to 5 key words which can be used for indexing purposes. Please avoid general terms and abbreviations. The Introduction presents the purpose of the studies reported and their relationship to earlier work in the field. It should not be a mini-review of the literature. Use only those references required to provide the most salient background to allow the readers to understand and evaluate the purpose and results of the present study without referring to previous publications on the topic. The Materials and Methods section should be brief but include sufficient technical information to allow the experiments to be repeated by a qualified reader. Cite previously published procedures in References. Avoid describing routine or trivial matters. Suppliers of chemicals should only be given if these are not generally available or are in some way unusual or are crucial for success. Manufacturers of equipment are given with model name, manufacturer name, and country (for example; gas chromatography (14B, Shimadzu, Japan)). The Results section should include the rationale or design of the experiments as well as the results of the experiments. Results can be presented in figures, tables, and text. The Discussion section should focus on the significance of the results rather than a repetition of the Results section. The Results and Discus sion sections may be combined into one section. Acknowledgments of financial support, technical assistance and so on are given in a separate paragraph. Kim declares that he has no conflict of interest. Lee has received research grants from Food Company A. Park has received a speaker honorarium from Drug Company B and owns stock in Food Company C.
If multiple authors declare no conflict, this can be done in one sentence: Kim, Lee, and Park declare that they have no conflict of interest. If all the authors declare no conflict, this can be done in one sentence: The authors declare no conflict of interest. Jeong WH, Sin MK. 2000. The effect on rats serum lipid of treadmill exercise and green tea extracts intake with high fat diet. J. Korean Soc. Food Sci. Nutr. 29: 683-690. Kim YS, Jo C, Choi GH, Lee KH. 2011. Changes of antioxidative components and activity of fermented tea during fermentation period. J. Korean Soc. Food Sci. Nutr. 40: 1073-1078. Peter FS. 1975. The toxicology of nitrate, nitrite and N-nitroso compounds. J. Sci. Food Agric. 26: 1761-1770. Bourne M. 2002. Food Texture and Viscosity: Concept and Measurement. Academic Press, London, UK, p. 96. SAS Institute, Inc. 2002. SAS User's Guide. Statistical Analysis Systems Institute, Cary, NC, USA. Singh RP, Anderson BA. 2004. The major types of food spoilage: an overview. In: Understanding and Measuring the Shelf-life of Food. Steele R, Alan T. (eds). CRC Press, Inc., Boca Raton, FL, USA, pp. 3-23. Yoo SH. 2009. Studies on the production of cheese whey protein based hydrolysates and development of health beverage containing bioactive peptide. Ph.D. thesis, Konkuk Univ., Seoul, Korea.Amore Pacific. 2010. Method for manufacturing fermented green tea, and green tea therefrom. Korea patent NO. 100975199. Han YJ, Cho Y, Lambert WE, Bragg CK. 1996. Image analysis procedure for evaluation of convolution characteristics of cotton fiber and their effects on fiber strength. In: Proceedings of 6th International Conference on Computers in Agriculture. June 11-14, Cancun, Mexico, pp. 785-794. Rehkugler GE, Throop JA. 1985. Apple sorting with machine vision. ASAE Paper No. 85-3543. ASAE, St. Joseph, MI, USA. Food and Drug Administration. Detection and quantitation of acrylamide in foods. Available from: http://cfsan. fda.gov. Accessed Dec. 27, 2003. Figures should be provided separately from the main text. Use Arabic numerals to number all figures (e.g., Fig. 1, Fig. 2) according to their sequence in the text. The figure number must appear well outside the boundaries of the image itself. Multipart figures should be numbered in uppercase and bold font letters (A, B, C, etc) without parenthesis, both on the figure itself and in the figure legends. Blurred images will not be accepted. Note that figures may have to be reduced in size to fit the one-column (7.5 cm) or two-column (16 cm) space of the printed page, as determined by the journal designer. Original figures, especially line drawings, must therefore contain fonts and other detail that are large and clear enough to be legible even after a 50% reduction in size. Line drawings must be a minimum of 0.5 mm thickness for clear reproduction. The preferred symbols for graphs are ○, ●, □, ■, △, ▲, ▽, ▼. Where possible, the same symbol should be used for the same quantity in different figures. Simple bar diagrams reporting only a few values are usually unnecessary; the data can normally be given in a few lines of text. It is editorial policy not to publish bar diagrams with "three-dimensional" bars unless there is a specific justification for their use. Tints should not be used as shading for bars. The author(s) will be required to pay for reproduction of color photographs. Any figures submitted in color will be reviewed and processed with the understanding that the figure will be published in color. Tables should be submitted as editable text and not as image. Tables should be also typewritten, together with their titles, separately from the main text and in an appropriate font size to preferably fit each table on a separate page at the end of text after the References. Their lay-out should be suitable for printing as either single column (7.5 cm) or double column (16 cm) width. Avoid vertical rulings (lines) and keep horizontal rulings to a minimum. Each table must be numbered with Arabic numerals (e.g., Table 1, Table 2). Place footnotes to tables below the table body and indicate them with superscript lowercase letters (a, b, c, etc), not symbols. Each column in a table must have a heading, and abbreviations, when necessary, should be defined in the footnotes. Research notes are short reports for the presentation of brief observation that have insufficient material to fulfill the structure of a full-length article. They are intended for reporting preliminary studies or brief studies of a descriptive nature. 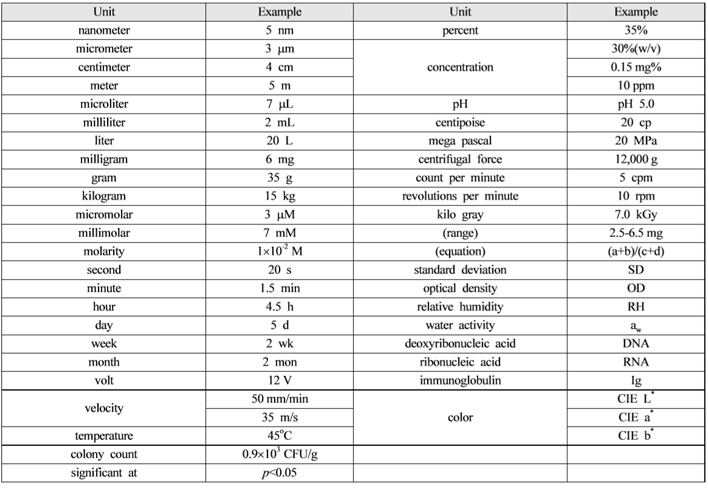 Notes should be arranged in the same way as Full-length research articles and the standard length of a published Note should be two printed page long including tables and figures. Reviews articles provide an analysis of a scientific or applied field, which include all important findings and bring together reports from a number of sources. Review articles are normally invited by the Editors or the Editorial Board. Reviews should be structured under appropriate section such as Introduction, Main body, Conclusion, and References with no restriction in format. There is no length limitation for Reviews. Reviews are subjected to independent peer review, and the Editor-in-Chief may request changes, or decide not to proceed with publication. Authors should consult a current issue for guidance. Always use Arabic numerals with units. All abbreviations should be defined at their first use in the text only; do not repeat the definition of abbreviations thereafter. SI and metric units should be used whenever possible. Please always leave a space between the number and the unit except % and oC; e.g. 100 mM not 100mM. If you use %, always state if this is v/v, w/v, v/w or w/w. Abbreviations are never made plural. Mixtures of solvents are given as chloroform/methanol (2:1, v/v) or methanol/water/acetic acid (60:35:5, by vol.). Followings are the example of unit style.